You KNOW there's money out there, and you could write a grant. But you just don't know where to look! This issue includes grants due in April (23), May (26), Federal (5), and grants funded by celebrities (12). 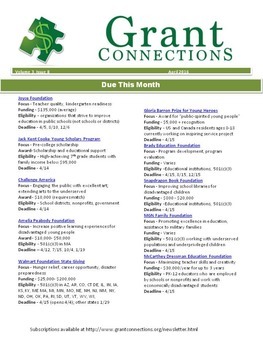 Some grant newsletters have tons of articles and only list a few (6-10) actual grants that are available. So that more can be included, this newsletter includes only basic information: Funder, Amount they will fund, Deadline, Eligibility, and - most important - a link to their web site - just click on the the name of the grant.